There’s something that your calf muscles are dying to tell you. Think about it. When you sit down, recline, or otherwise get off your feet, what happens to your calf muscles? They check out of the program, don’t they? This is fine for awhile – especially if you have been on your feet and active all day. But what if the reverse is true for you: up for an early breakfast and maybe a short walk or other bout of fitness, followed by a commute to work where you spend hours mostly seated at a desk, punctuated by bathroom and lunch breaks. Maybe ‘lunch’ is even spent sitting down at a table, or even at your desk, as you catch up with personal tasks, correspondence, or simply reading a good book. Commute home, dinner seated at a table, evening…well, you get the idea. Remember when we talked about 5 reasons too much sitting is hazardous to your health & what to do about it? Today we’re going to take a look at more of the specifics of inactive physiology when it comes to one of the key players that you may not know play a major role in your metabolic function – your calf muscles. Plus, I’ve provided you with a bonus video so you can take action right away. 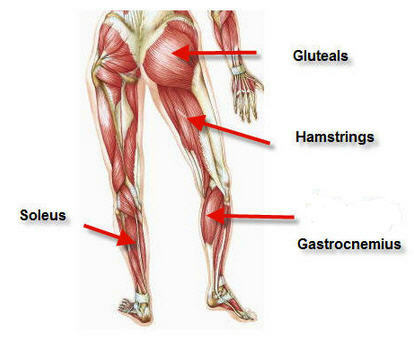 Your calf muscles have the very important – and very distinguished role – of being what we call your ‘peripheral pump’. That’s because they reside outside your body cavity yet, like your heart, play a significant role in healthy circulation. This is also exactly why having the calf muscles checked out of the program for extended periods of time – as happens with sitting or reclining – can not only be less than optimal for your health, it’s hazardous. As peripheral pump, not only do the calves assist in your locomotion, they also have the important role of moving your blood, against gravity, from your lower extremities and back to the heart for re-oxygenation. Picture this: to keep circulation in your lower legs fresh, blood is sent to your lower legs via arteries, arterioles and capillaries. Partially. Yet extended periods of time standing has delivered it’s own brand of health problems as well. The static nature of simply standing doesn’t do much more for the calf muscles than sitting. Any way you look at it, inefficiency of the calf muscle pump leads to poor circulation, reduction of venous return, and lymph system slowdown. As it turns out, the best option for overall health is varied options of you position during the day. That means alternating sitting with standing – and being sure to move around to get those calves in gear. The simple quick solution to work into your day is Fit Quickie #10 – Legs Into Play – so named because it brings all the muscles of the legs into play quite quickly, specifically targeting the muscles of the calves. This gets your peripheral pump immediately fired up, resulting in increased circulation, oxygenation of the blood, and removal of excess fluid in the lower extremities. The result? Instant invigoration, restored mental clarity, increased energy and improved outlook. In seconds. You’ll find all the detailed instructions for setup, alignment and practice of Fit Quickies #10 on pages 137 – 146 in my book Fit Quickies: 5 Minute Targeted Body-Shaping Workouts. The Fit Quickie #10 practice video is provided for you here. Be sure to pay attention to aligning your body correctly, keeping your posture strong with vertical spine in neutral, anchored position, legs straightened, and gluteals contracted to create the workload throughout the body. In Fit Quickie #10, I also emphasize that by contracting your gluteals and maintaining a straightened leg, the other muscles of your legs come into play as well, including the hamstrings and the quadriceps. This assists the whole blood flow and muscle engagement operation to your benefit. Not only to get give your circulation a boost, you are getting leg-shaping benefits as well. Break up both periods of sitting and standing by alternating them through your day. Practice Fit Quickie #10, Legs Into Play, several times a day – whenever you get a chance. For example, right now I am standing at my home office computer station – and am doing a few quick reps or rising to my toes and down again as we speak. It’s that easy to fit it in. If you MUST be seated for an extended time – such as in the window seat on an airplane, ideally you would get up and stand or walk around the plane for a few minutes. In a pinch, you can do Fit Quickie #10 in seated position. Try it! Elevate your legs intermittently during the course of the day. When the calf muscles are not doing their job properly, your whole system gets backed up. Try Legs Into Play now – or as soon as you get a chance – and then report back in for a star on the exercise chart! lol Thanks Lani for letting me know what I am doing IS the right thing to do (lotsa Legs into Play or Leg Plays as I call it). This exercise is a life-saver for me! Thanks! I figure a little more info and inspiration never hurt anybody. Go Paym go! Lani, How funny that you sent this out today. Just yesterday I brought a yoga mat, a 3 pound weight and a playground ball into my office at work. Last week I moved all my office furniture around so that I would have room to do some Fit Quickies and some yoga. The last step I took – just yesterday – was to make specifically Fit Quickies 10, 2, 6 and 3 very easy for me to find on my computer. I come into work today, and voila! Here is this email link from you. Thanks and cheers!!! Nancy, what role modeling! I am so happy to read your report. You’ll have to take a snapshot of your setup. You rock! Great information! Thank you so much for spelling it out…I am changing how I go throughout my day immediately! Hi Katie! Thanks for checking in – would love to hear more about what you start doing differently!